Myths and misconceptions are easily attached to the subject of heraldry, what else would you expect from a science and art form that so readily embraces fantastic beasts such as the unicorn or the dragon? This page of Frequently Asked Questions should help you tackle some of those common myths and misconceptions. I’ve seen my 'family crest' for sale on another website or in a shop, is this trade legitimate? Websites and shops selling 'family crests' (see next FAQ) or coats of arms are, at best, selling an image of someone else’s arms. If you purchase one of these images you are simply purchasing a copy of a picture, nothing more. This is known as ‘bucket shop heraldry’ and buyers should beware aware this is a form of scam or to give its legal definition: Fraud. A grant of arms, or more properly armorial bearings, is a form of honour and as fount of honour only the Sovereign has the power to grant arms; this power is delegated to the Earl Marshal in England, Wales, Northern Ireland; the Lord Lyon in Scotland and the Governor General in Canada. In any country where HM Queen Elizabeth II is Head of State the granting and usage of arms is regulated in law. Are family crests and a coat of arms the same thing? There is no such thing as a family crest, and there never was. The crest is a specific part of a coat of arms (everything on top of the helmet) and not the same thing as the whole coat of arms. A ‘crest’ is not a synonym for arms and the two things should never been confused. In the United Kingdom crests are only granted to males, in Canada both men and women may be granted a crest. What are the Pantone® colours used in heraldry? Heraldry predates any standardised colour model by many centuries; the choice of exact shade of colour used in the depiction of arms is a matter for the artist. Generally the colours used in heraldry are bold, bright and distinct, akin to those of the child's paintbox. Are the mottos associated with coats of arms always in Latin? Surprising as it may be, the motto is not part of the lawful grant of arms in English heraldry and there is no requirement for arms to have a motto. The use of a motto is at the choice of the grantee (lawful owner of the arms) and may be expressed in any language. In Scottish heraldic law the motto is part of the lawful grant, and may not be changed by the grantee, even so the motto may be in any language. How are coats of arms connected with surnames? Coats of arms are granted to a single named person and their heirs. A persons surname is not directly connected with their coat of arms, so there is no coat of arms for the surname Edwards, Jones, Smith, Williams, or indeed any other surname and there never was. The trade of bucket shop heraldry (see the first question in this list of FAQs) thrives on the misconception that surnames are connected with coats of arms. Mr A.Smith of 14 Acacia Avenue, Wimbledon, London may be granted arms which are inherited in the male line and may be used by unmarried daughters. Miss J.Smith of The Lodge, Ickworth, Suffolk may also be granted arms which she uses in her own right. Mr A.Smith and Miss J.Smith are unrelated. The arms of Mr A.Smith and Miss J.Smith will be different. May men and women be granted arms? Men and women can be granted arms in their own right, although arms granted to men by either the Court of the Lord Lyon or the College of Arms may only be inherited by sons and used by courtesy by wives and daughters (until the daughter marries) as the law stands today. Wives may impale (join) their arms with those of their husband. How does one obtain a coat of arms? The granting authorities for coats of arms in the Commonwealth Realms are: The Court of the Lord Lyon in Edinburgh (for Scotland), The office of the Chief Herald of Canada (for Canada), Her Majesty’s College of Arms in London (for the rest of the UK, other Commonwealth Realms, Crown Dependencies and British Over-seas territories). Other countries with heraldic authorities empowered to grant or regulate the use of personal arms include: Ireland, Kenya, South Africa and Zimbabwe. Note: Many other countries have heraldic authorities that grant or regulate the use of national, civic, corporate or military arms, but not personal arms. How can I find out if my family had a coat of arms in the past? Coats of arms are granted to a single named person and their heirs (male heirs only in the UK, male and female in Canada since 1988). The heraldic authorities will be able to help you determine if an ancestor was granted arms. Are all coats of arms unique? Within the domain of a heraldic authority all arms are unique. Uniqueness is defined as ‘at least two differences, not including a change in colour’. 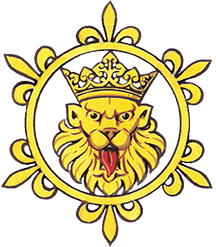 So a red shield with a gold lion standing on its hind legs is not sufficiently different from a red shield with a silver lion standing on its hind legs to be considered unique. A third red shield with a silver lion standing on its hind legs wearing a crown and holding a axe in one of its paws is sufficiently different to be unique. What are the rules about the tinctures that may be used in heraldry? Colours: Red, green, blue, black and purple and less often sky blue, tawny brown, carnation pink. The precise depiction of the colour is down to the artist but they are invariably the bold, bright, distinct colours of the child’s paint box. There are rules of combination that restrict practices such as putting metal on metal, colour on colour, fur on fur. Furthermore gold or silver should always be depicted on the shield as just gold or just yellow, and just silver or just white, but never both gold and yellow or silver and white. Are coats of arms only granted to Lords and Knights? Certainly a peer of the realm in the United Kingdom would be eligible for a coat of arms, as are baronets and the higher grades of knight in the various chivalric orders is also eligible; however coats of arms may be granted to any subject of the Crown of good character and sufficient eminence. Arms have never been restricted to the knighthood or peerage. What constitutes 'eminence' where the granting of arms is concerned? The Kings of Arms have absolute discretion in determining whether a person petitioning for arms is sufficiently eminent; there is no prescriptive list of qualifications that a person must hold. However a perusal of recent grants to eminent persons, such as are recorded in the College of Arms newsletter, will give the reader a clear indication of the criteria that the Kings of Arms consider. Are coats of arms a form of trademark? Heraldry and coats of arms predate the concept of trademarks by many centuries, and in law they are distinct things. While it is possible to register a coat of arms as a trademark it is unnecessary to do so if the arms are lawfully granted since the grantee’s right to the arms are already well defined and fully protected in law in the UK and Commonwealth Realms. May corporate entities be granted arms? Any distinct legal entity that the law recognises as a legal person (e.g, a company, a local authority, a Crown corporation) may be granted arms. This includes universities, learned societies, professional bodies, trading companies, county councils, district councils and even parish councils. What is an officer of arms? Officers of arms are appointed by the Crown and study, grant and regulate the use of heraldry. The officers of arms are ranked by grade starting with a King of Arms, followed by a Herald, and the most junior grade is a Pursuivant. Why do some coats of arms have animals holding up the shield? Peers of the realm and knights of the most senior orders of chivalry are entitled to supporters either side of their coat of arms. These supporters must be unique and are either granted for life in the case of a knight or life peer, or hereditary in the case of a hereditary peer. Corporate bodies formed by Royal Charter may also have supporters for their arms. How can I learn more about heraldry? This website contains a wealth of information, as do the websites of the various granting authorities. There are also many excellent books on the topic (see bibliography) and of course the Heraldry Society’s lectures and magazine are another excellent source of authoritative reference.